Microsoft SQL Server is one of the most common SQL servers in the industrial environment. In modern industry 4.0 production, databases form the heart of networked production. All relevant data for optimal production is stored here and made available to other systems. 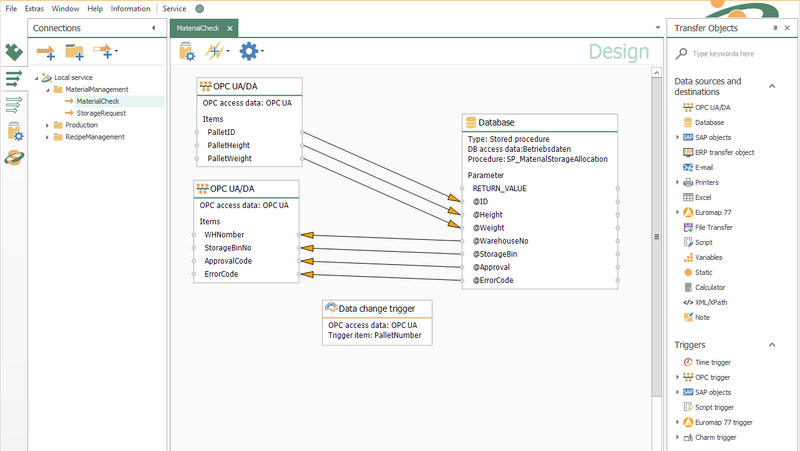 With the OPC Router Plug-in for MS SQL Server you can easily connect to the SQL Server and access its tables, views and procedures (Example on the right). In combination with the other plug-ins, you can easily collect data from various systems in the SQL Server and distribute it back to the right system at the right time. For example, you allow the PLC (via OPC UA) to access the SQL server or very simply transfer data from SQL to SAP. The plug-in list gives you an overview of all coupling options. By connecting Microsoft SQL via the OPC Router, valuable data can be distributed and recorded between systems. Making that vital connection, eliminates island systems as well as propels and mobilizes interconnected production of applications, which were designed with SQL. This can also give a powerful edge to smaller systems and PLCs. Once you have established a connection between the Microsoft SQL server and your systems, many new options for crosslinking and data transfer are open to you within the broad scope of industry 4.0 implementations. A classic application here is the coupling of SQL to OPC where the OPC Router acts as OPC Client. The OPC Router helps you connect your systems as data hub . Numerous plug-ins are available, which make the OPC Router the ideal middleware in industrial settings. That’s how easy it is. The transfer object MS SQL plug-in allows access to Tables, Views and Stored Procedures in the database. The following actions are available for tables: Select, Update, Insert and Delete. After successful data processing, the OPC Router can mark (i.e. identify) the transferred data as such. Access Views exclusively via Select Query. When accessing any stored procedure in the database, Execute is carried out by the OPC Router. During the process Input Parameter can be transmitted. It is also possible to read back retrieval information as well as return parameters (and also results). The MS SQL Plug-in has its own database trigger. The database trigger monitors (i.e. checks) changes in Table columns. The OPC Router sends a change notification when a change occurs and then triggers a connection. The database trigger does not have outgoing data fields. The MS SQL Plug-in can browse all available objects of the MS SQL server. All tables and views the user has access to are read out from the MS SQL Server and then the columns and their types are distinguished and made available for user-specific selection. The available stored procedures are also read out. Depending on the respective procedre, input and output parameter are read out together with the type information, and made available for selection. The obligational return value is automatically made available. With the OPC Router you create the basis for your production data acquisition system. The various plug-ins allow you to load data from various systems and transfer it to the evaluating target system. Typical targets are MES systems (Manufacturing Execution System) or ERP systems (Enterprise Resource System (e.g. SAP)). Due to the simple configuration, a Microsoft SQL Server can be used as a central operating database and the systems with the data sources are connected graphically and without programming. Existing operational data collections can often be connected via an SQL Server connection and are supplied with data via this connection. A typical example of data collected for production data acquisition is control data from PLC systems. Controllers are connected via the standardized OPC UA protocols (with the OPC UA Client Plug-in). To exchange data between SQL Server and other systems only the OPC routers graphical designer is needed. After the connection parameters of the database have been announced and tested, the database objects can be searched and selected. In the connections the data transfers between an external system (SAP, MQTT, OPC, REST, etc.) and the SQL Server are established. Once the project has been published, all data transfers can be checked and viewed in the graphical monitoring system. How do Transfer Objects, Trigger and Browsing work? The OPC Router establishes connections between systems that address core functions of the OPC Router. Functions of the respective plug-ins may vary, due to the different nature of each connected system. Transfer objects are the sources and destinations inside the OPC Router. They contain data fields with read and write functions. Depending on the respective interconnected system, the possible configuration scope of sources and destinations may vary. Inside the OPC Router configutation, the Transfer Object abstracts the respective system context of any connected system into a simple data input and data output block. Thus, the functions can be treated in the same way although each connected system has very individual features. Triggers determine execution time of data transfers. Various Triggers can be active, independent of source or destination. Various Triggers can be used in combination via AND/OR-connections. Triggers can also serve as data sources if the prompting event is coupled with receiving data. The configuration of sources and destintions is simplified. Differing browsing mechanisms are available, depending on the type of system and/or plug-in. Even complex structures can be selected without requiring detailed knowledge about subsystems. The plug-ins presents structures of data sources according to the specification of the respected plug-in.